Emperor Akihito of Japan during his audience with Kuwait Speaker of Parliament Marzouq Al-Ghanim in Tokyo on Thursday. 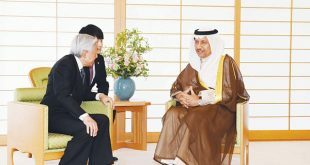 KUWAIT CITY, March 15, (KUNA): Japanese Emperor Akihito lauded Thursday the significant and historic ties linking Kuwait and Japan, adding that he greatly admires and respects the leader of Kuwait His Highness the Amir Sheikh Sabah Al- Ahmad Al-Jaber Al-Sabah for his regional and global reputation. Emperor Akihito’s praise came during his reception of visiting Kuwaiti Speaker of the National Assembly Marzouq Al-Ghanim. The Emperor thanked Kuwait and its people for their contributions to the relief aid efforts after the tsunami, which hit Japan in 2011. 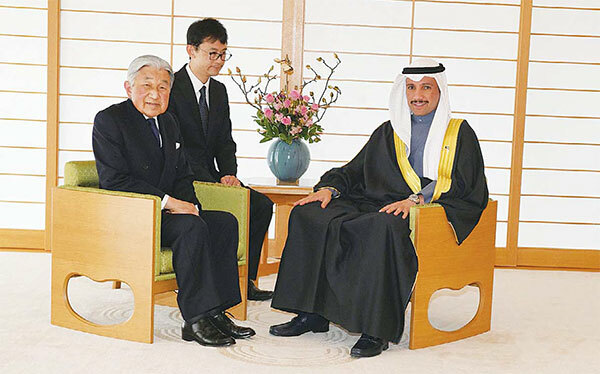 Emperor Akihito also praised Kuwait’s role in the Middle East region and the world, affirming that His Highness the Amir was an example of a great and wise global leader. On his part, Speaker Al-Ghanim conveyed greetings from His Highness the Amir to Emperor Akihito, saying that both nations were eager to develop ties furthermore. 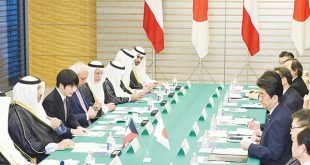 Speaker Al-Ghanim expressed Kuwait’s gratitude towards the unwavering Japanese stance during the Iraqi invasion of 1990 and the liberation of Kuwait in 1991, affirming that relations continue to become stronger as both countries are looking into new means to boost bilateral ties. Kuwaiti Ambassador to Japan Abdulrahman Al-Otaibi was present at the reception. Al-Ghanim arrived in Tokyo on Monday. He met Japanese Prime Minister Shinzo Abe, House of Representatives Speaker Tadamori Oshima and House of Councillors President Chuichi Date. He also held talks with Chairman of Japan Business Federation’s Middle East and North Africa Committee Yasushi Kimura. 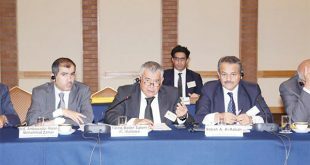 The Kuwaiti delegation includes MPs Naif Al-Merdas, Osama Al- Shahin, Khaled Al-Shatti, Khaled Al- Otaibi, Majed Al-Mutairi, Mubarak Al-Harees, Mohammad Al-Dallal, Abdulwahab Al-Babtain and Nasser Al-Duwseri.